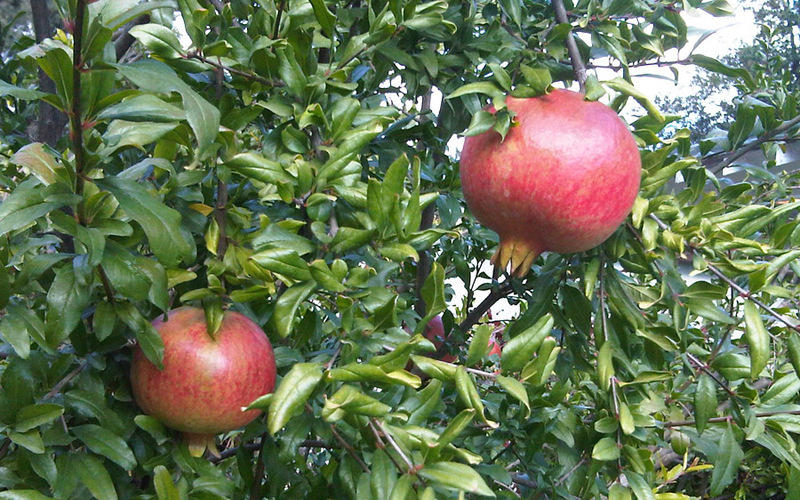 There is a pomegranate tree in Ray’s Garden — not a big tree, almost more of a bushy shrub — but early this past summer it became obvious that it was going to bear a very good crop this year if all went well. 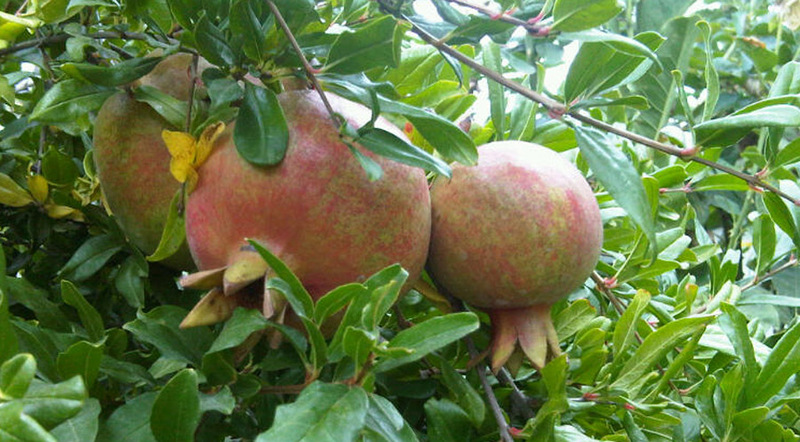 Hard little green lumps at first, the fruits soon took on their traditional pomegranate shape. Distribution: Native to Persia and the Himalayas in Northern India. It has been cultivated in the Caucasus since ancient times, the drier parts of southeast Asia, the Mediterranean region of Southern Europe, and tropical Africa. 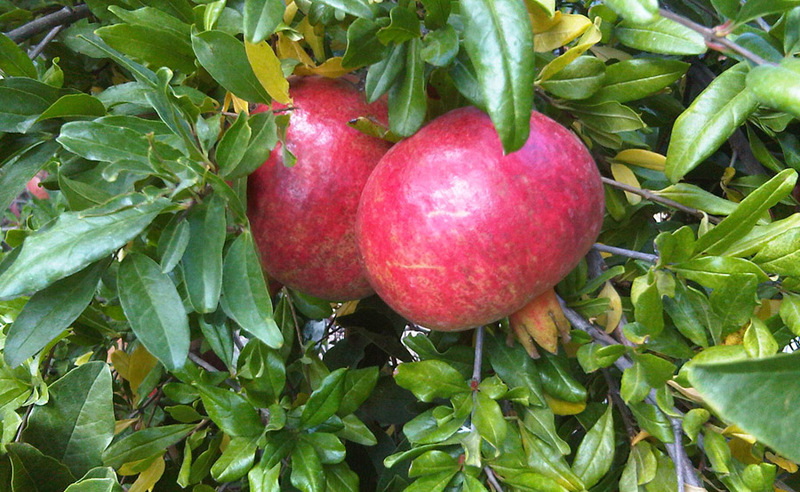 Introduced into Latin America and California by Spanish settlers in 1769, pomegranate is now cultivated in parts of California and Arizona. Not only were they growing redder, but the small tree was, by October, filled with dozens of very large fruit — ready to burst with ruby-colored goodness. 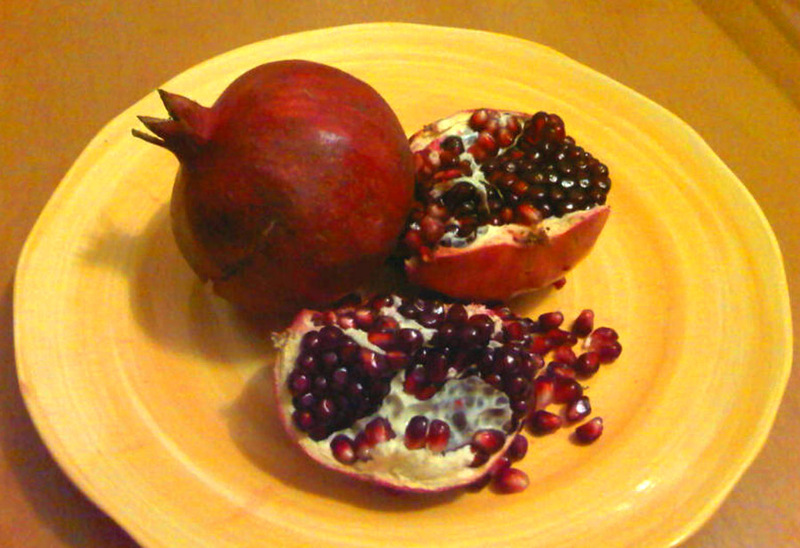 Eating a pomegranate is definitely a task that is better accomplished in the kitchen than at one’s desk. They take work, but they are most certainly worth the effort. There are options: We can return to our childhood and just dig in and enjoy, not minding that we become a mess in the process. Or we can do all the work at once, near a sink, gathering an entire bowl-full of glistening red seeds to eat tidily with a spoon at our leisure. Or — we could try something like this: www.simplyrecipes.com/recipes/kiwi_salsa/ — that sure looks good to me! 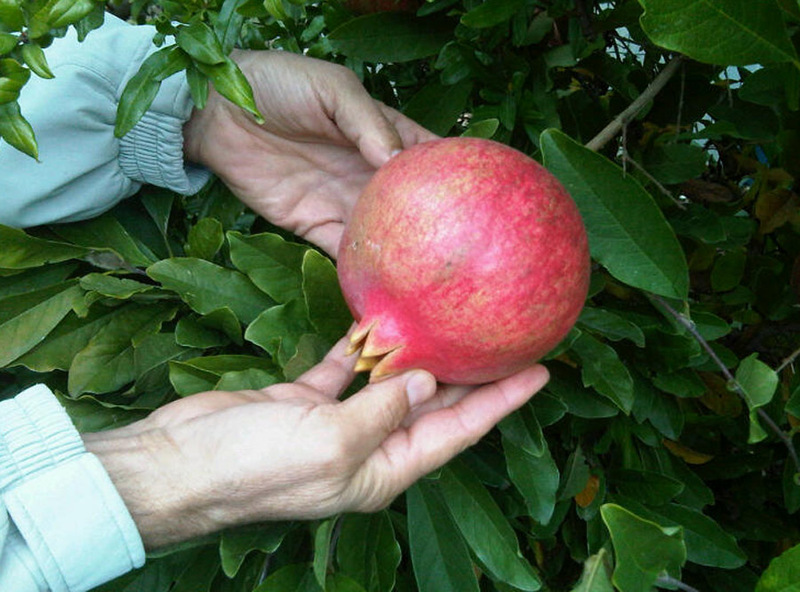 The inner beauty of the pomegranate has inspired design since Biblical times, and there are some who believe it may be the fruit on the tree of life. ~ Anon. This entry was posted in beauty, Garden, growing, harvest, peace, Uncategorized and tagged fruit, Garden, growing, harvest, pomegranate, seasons by tosgarden. Bookmark the permalink.